Leftover turkey? We thought so. If you’re worried about having more turkey than anyone could possibly consume, have no fear! 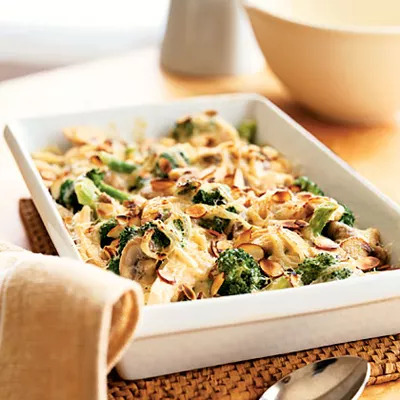 It’s easy to refashion Thanksgiving leftovers into something creative, like this turkey-broccoli bake. Its flavors are decidedly not traditional Thanksgiving fare, making it a welcome change from all things squash, pumpkin, and cranberry. Instead, broccoli, mushrooms, almonds, and Parmesan gives this poultry a fresh update. No need to eat turkey sandwiches for a week or feel guilty about wasting food. And with protein, vegetables, and healthy fats, this is also a complete meal. After a week of nonstop cooking and dishwashing, that's a definite plus.